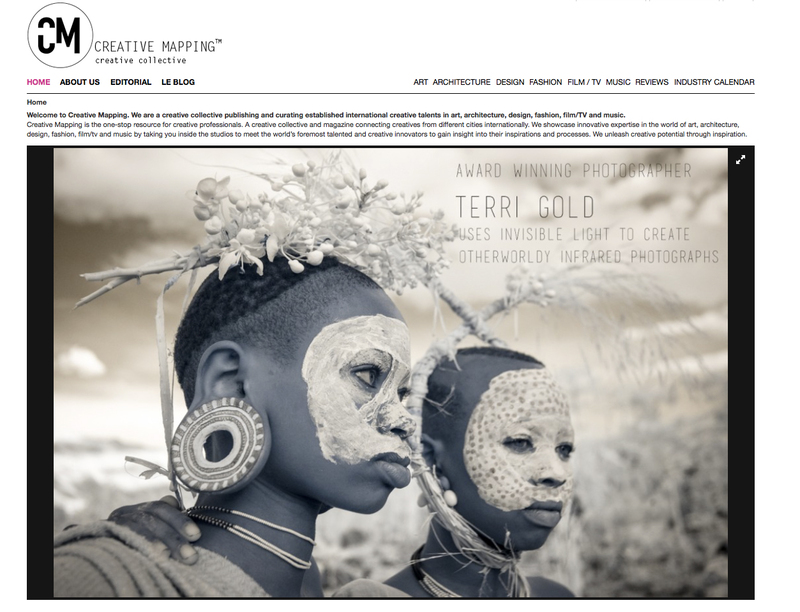 Thrilled to have my work presented on Creative Mapping- the creative collective blog. Award-winning, fine art photographer and creative nomad Terri Gold captures her beautiful, other worldly photographs of tribal and nomadic cultures and their rites using invisible light. This light which cannot be seen exists on the invisible part of the spectrum and is captured by infrared sensitive film to reveal a enchanting and poetic under-layer. At home in unfamiliar lands, the wanderlust fueled photographer lives a surreal existence where time and centuries coexist. As an outsider, Gold’s ability to tap into foreign worlds with such an intimacy whilst also emphasising the mystery encapsulated within their rituals and ceremonies is an impressive balance. And her talents are held in great esteem within the photography and creative worlds. Traveling across oceans, deserts and deep into the bush with up to three cameras in tow along with an ever growing passion and wanderlust, Gold is seeking to shine light on the fragility of tribal cultures seemingly untouched by time; using a light that cannot be seen with the naked eye. CM: Your work has been published in numerous digital and print outlets, what first garnered notice of your work? This entry was posted in Africa, Artists, Asia, Cultural Diversity, Ethiopia, For Photographers, Infrared Imagery, Ladakh, MIao, Niger, Nomads, Press, Tribal Culture and tagged Creative Mapping, Paris Photo 2015. Bookmark the permalink.